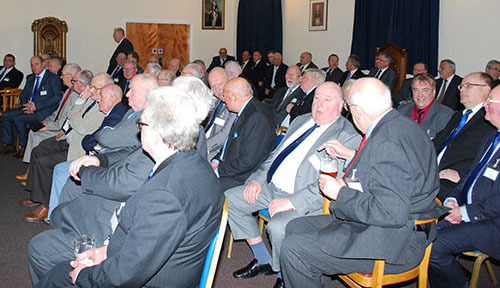 The Ormskirk and Bootle Groups held their second bi-annual Masters and First Principals Festival Dinner, since the groups amalgamated in 2016 with the meeting being held on this occasion at the Ormskirk Masonic Hall. For the evening’s celebrations, the group were honoured by the presence of the Deputy Grand Superintendent Paul Renton, who was accompanied by Assistant Provincial Grand Master Frank Umbers. Also, in attendance were Peter Taylor Provincial Grand Secretary, Robert Case Provincial Grand Scribe N and representing the group, chairman Graham Chambers and vice chairman Malcolm Alexander. Also, in attendance on the evening were representatives from the Southport Group. 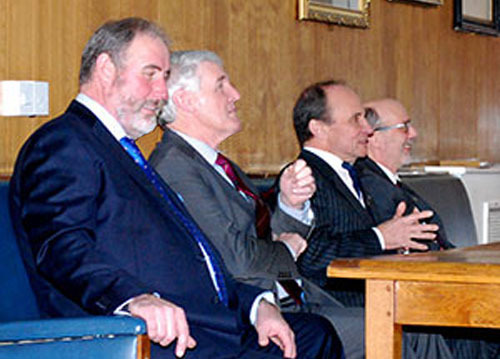 The principal guests answering questions, from left to right, are: Frank Umbers, Paul Renton, Peter Taylor and Robert Case. The running for the evening was left in the very capable hands of the two Provincial Deputy Grand Directors of Ceremonies who were present, Mark Barton and Malcolm Bell. The evening began with an informal ‘meet and greet’ where the WM’s, IPM’s from the Craft and the first principals and past first principals from the chapters within the group, were able to meet for an informal chat with the senior officers of the Province who were in attendance that evening. After which the rest of the brethren made their way into the main lodge room for an informative question and answer session. Paul Renton started by welcoming everyone to the question and answers session and introduced Frank Umbers, Peter Taylor and Robert Case, who between them were able to answer all the questions. 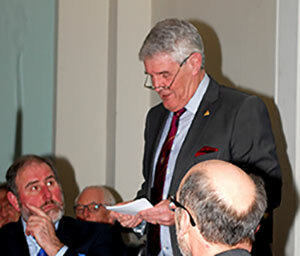 The session was a very friendly, lively and open affair, with a wide range of topics involving Masonry being covered, including recruitment and retention, with many other topics being discussed before the Malcolm Bell called proceedings to an end. With the question and answers session being completed everyone made their way to the dining room, where an excellent dinner was served starting with a black pudding stack, followed by roast beef, with Yorkshire pudding and seasonal vegetables and for dessert, profiteroles with chocolate sauce and pouring cream, which was shortly followed by tea or coffee and mints. The audience during the question and answer session. After dinner Ian Tupling, the first principal of Stanley of Bickerstaffe Chapter No 3511 had the privilege to propose a toast to the health of the principle guest Paul Renton, touching on Paul’s life and Masonic career, with some interesting facts on his working life and hobbies. In response Paul thanked Ian for the toast to his health and the way he had delivered the toast. Paul then went on to inform the brethren that the success of the group was down to the previous and current chairmen, and thanked Frank and Graham for all their hard work they have given to the group over the years. Paul proceeded to thank the Provincial Deputy DC’s Mark Barton and Malcolm Bell for their assistance they had given during the evening. Paul then spoke about the Royal Arch and informed the brethren about its history in the late 18th century and how the ceremonies were then performed as a progression through the veils from the Craft. In conclusion to his response, Paul thanked Graham Chambers and the group for inviting him to the evening. Robert Case had the pleasure of proposing a heartfelt toast to the Ormskirk and Bootle Group. During his toast Robert named the brethren who were attending that evening from the group who would be receiving Provincial Grand Lodge honours in Blackpool in May and Provincial Grand Chapter honours in October at Southport, with every name mentioned receiving a round of applause. Paul Renton responding to the toast to his health. Graham Chambers in response to the toast to the group thanked Robert for his toast, before having the privilege to present a number of cheques on behalf of the Ormskirk and Bootle Group of Lodges and Chapters totalling £5,500. Details were: £1,500 to the Litherland Masonic Hall which was received by Ian Mackinnon, Litherland Masonic Hall Chairman, £1,500 to the Ormskirk Masonic Hall which was received by Mike Dutton, Ormskirk Masonic Hall Treasurer, £250 to FROTH received by Marks Sands FROTH Chairman, £250 to HOME received by Jim Carrie HOME Chairman, £500 to Derian House on behalf of the Charnock Richard Masons which was received by David Rawcliffe chairman of their hall committee, £750 to the MCF 2021 Festival received by Malcolm Sandywell group charity steward, £250 for Sefton Women’s and Childrens Aid on behalf of the Bootle Ladies Group which was received on behalf the Bootle ladies group by Russell Skidmore, £250 for Derian House on behalf of the Ormskirk Ladies Group which was received by Alan Johnson on behalf of the Ormskirk Ladies Group and finally a cheque for £250 to the Friends of Tithebarn which was received by Alan Hore group Tithebarn representative. With the cheque presentation being over, Graham thanked the brethren and companions for their charitable giving asking the brethren and companions to thank their lodges and chapters. With the evening coming to an end, a presentation of a bottle of whisky was made to Paul by Graham on behalf of the group and another bottle of whisky was presented to Frank by Graham again on behalf of the group, with the evening coming to an end everyone retired to go home after agreeing it was a very successful and enjoyable occasion. Pictured are the recipients of the cheques with Paul Renton and Graham Chambers.